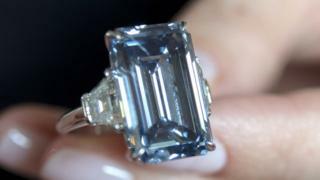 A big diamond known as the Oppenheimer Blue has set a new auction record, reaching a price of $50.6m (£34.7m). The 14.62-carat gem was sold after 20 minutes of phone bidding at Christie's auction house in Geneva, Switzerland, on Wednesday. It had been expected to fetch $46m. The buyer's identity is unknown. In 2013, Sotheby's sold a diamond for $83m (£56.8m), but its buyer could not afford the price and the auction house took the gemstone back. The diamond is understood to have got its name from the late Sir Philip Oppenheimer, who worked for de Beers and ran the Diamond Trading syndicate in London.